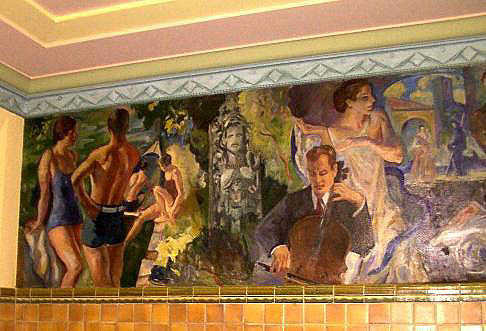 Myron Nutting was commissioned in June 1934 to design and paint the Wauwatosa High School murals in the school’s art-deco style front lobby. 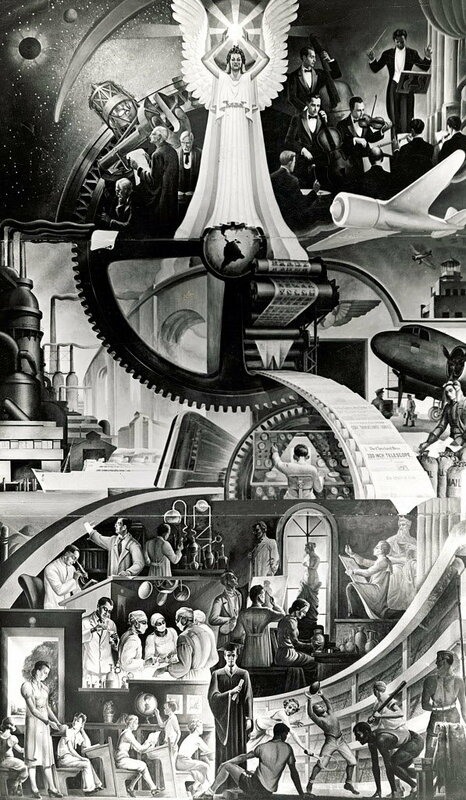 Anyone who stood by the railing at the well between classes will remember the three-story high mural “Spirit of Education,” the WPA mural, in the main entrance hallway of Lincoln High School in the Cleveland Municipal School District. The mural is now a cultural and historical memorial which was painted specifically for the school in 1939 by artist, William Krusoe. 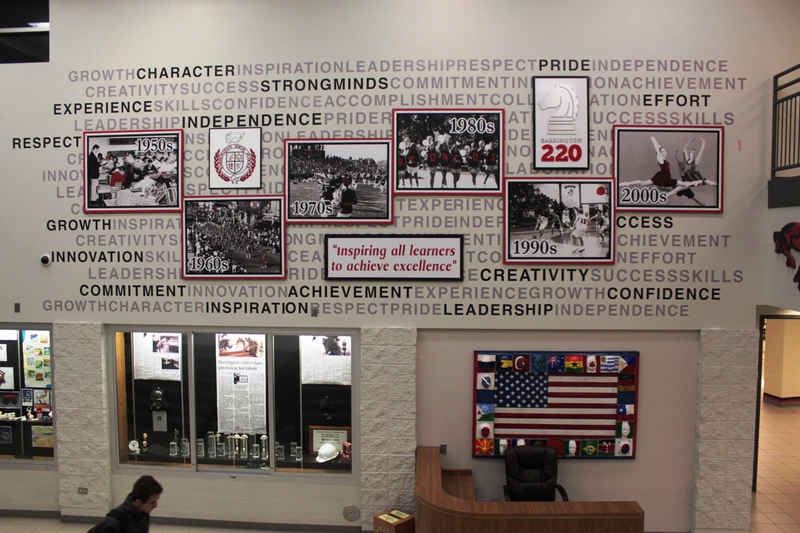 The large mural on the east wall of Dubuque’s Senior High School was painted by Cyrus Ferring in his spare time, the necessary expense borne by the student fund, and is a gift from Mr. Ferring to the school. It was hung in its present location in the summer of 1935. This appeared, unannounced, over winter break in January 2013, filling some available space above the already-busy entry wall of Barrington Huge School. Rotating displays concerning student activities (occasionally giving way to student art), sit next to a patriotic collage hung over the shoulders of the reception desk attendant. Rather than taking the allegorical approach used by many artists commissioned in times of financial uncertainty, the new piece consists of politically-correct buzzwords partially obscured by reproductions of yearbook-style photographs, each representing a decade of this particular school’s history; current logotypes used on district and school stationery; and the district’s “motto,” written in the style of other nearby districts. The application of spot color in the monochromatic reproductions, popular in 1980s television commercials and used sparingly (once) in a 186-minute Stephen Spielberg film twenty years ago, is employed no fewer than five times, apparently in an effort to unify the images. 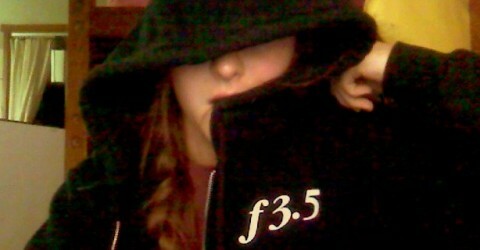 The designer is anonymous (design may have been by committee).